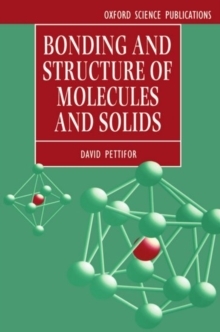 This is the first book to adopt an unconventional approach to the theory of bonding and structure of molecules and solids. It explains the observed trends in this field within the framework of simple models of electronic structure. Emphasis is placed throughout on recent theoretical developments that link structural stability to the local topology or connectivity of the lattice through the moments of the electronic density of states. This modern real-space approachallows an immediate understanding of the origin of the structural trends within the periodic table for the elements and the AB structure map for binary compounds. Final year undergraduates and graduates following a course in quantum mechanics will find this book to be highly valuable. A chapter onbasic concepts is included for readers new to the subject.